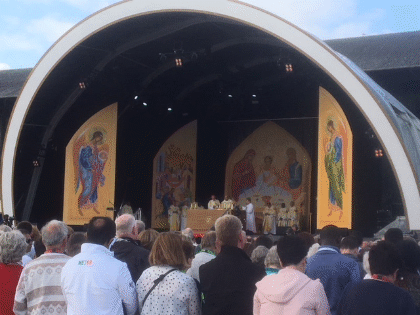 It is August 2018, and 37,000 Roman Catholic pilgrims from 114 countries have arrived in Dublin for the Pastoral Congress of the World Meeting of Families (WMOF). Awaiting them, a programme of 76 workshops in nine meeting halls, including 60 with simultaneous interpretation. Thanks to Alexandra Hambling, Calliope-Interpreters’ member for Ireland, they were to enjoy high-quality interpreting of discussions on a range of theological issues, while meticulous planning and careful recruitment were to ensure that optimal use was made of a tight budget. In this interview, Alexandra talks about the issues involved, and how she implemented her tailor-made solution. Alexandra, describe the nature of the challenge your client was facing. The client wished to provide interpretation in up to four languages (English, French, Spanish and Italian) at a large number of workshops: up to nine would run in parallel at any one time, each with different interpretation requirements. This already complex situation was made more challenging by the scale of the event and the number of participants, which called for an innovative technical solution. You can’t distribute 37,000 headsets each day and collect them for recharging each evening! Budget was also a significant factor: the Catholic Church regularly relies on volunteer interpreters, but this time - recognizing the high stakes - opted for professional conference interpreters, while looking to optimize its budget. Why were you chosen to provide a solution? I was awarded the contract after a competitive tendering procedure which began back in 2015. I believe that three factors were crucial in the organizers’ decision. First, I am a consultant interpreter, as opposed to an administrator, and I therefore have an in-depth and hands-on understanding of how to assemble multilingual interpreting teams. Secondly, many of the topics to be addressed at the WMOF were to be theological, and the speakers were to include bishops, archbishops and cardinals. I recognized very early on that the interpreters would need to have a Catholic background to be able to identify with and understand the themes. It is not often that attending catechism classes is a prerequisite for interpreting at a conference, but in this case, that was precisely the knowledge that I needed my interpreters to be able to tap into. Thirdly, due to the nature of the subject, I also guaranteed that all my interpreters would work into their mother tongue, and that there would be no relay interpreting. Even if you have an excellent knowledge of another language, you will not necessarily know the words of the “Our Father” or other Eucharistic formulations in that language. Use the wrong form of words and you will quickly lose the confidence of your listeners. I have worked as a consultant interpreter for nearly 15 years now, and have gathered valuable experience of events of all shapes and sizes. However, every event is unique, and my aim is to provide a bespoke solution taking into account the client’s wishes and the various logistical constraints. My approach is simple: optimize the budget without compromising on quality. To do so, I recruited a balance of interpreters from Ireland, who contributed their knowledge of the local accents, place names and context; interpreters from Spain who regularly translate at religious events; and interpreters from Rome with solid experience of working for the Vatican. The vast majority of the interpretation work was from English into the other languages, but there were several sessions where interpretation into English was required. My strategy here was to recruit dual-mother-tongue interpreters to provide the English interpretation, obviating the need to recruit additional English-booth interpreters for those short assignments. What was the ultimate solution and how did you implement it? I recruited a team of 35 interpreters, who were each assigned to several sessions every day, and appointed an experienced team leader for each session. Careful allocation of interpreters, taking into account the distance between meeting halls as well as language combinations, meant that the total number of interpreters was kept to a minimum. My personal touch came from the fact that I know my interpreters very well and could match them with the workshops’ themes: a Mexican interpreter in the workshop on Mexican realities; an interpreter food-blogger in the workshop with a priest-chef, etc. Flexibility was the order of the day to accommodate last-minute changes to language regimes or session times. To ensure that everything went smoothly I briefed all the interpreters thoroughly, from how to prepare for the meeting themes to security, accommodation and travel arrangements. With 200 speakers expected, it was a challenge for the organizers to provide the interpreters with the speakers’ notes for each of the sessions. The interpreters’ specific preparation was therefore key, even though they all had extensive experience of Catholic events. Well ahead of the event I advised them to study Amoris Laetitia (Joy of Love), Pope Francis’s document about love, marriage and family life, which would form the basis of the discussions. One interpreter prepared a valuable comparative table of Amoris Laetitia in four languages and shared it with the team, enabling all the interpreters to quickly find quotes during speeches. I mentioned the need for an innovative technical solution. A significant factor in the success of the event was also liaising with the sound technicians, who were responsible for the equipment. The Broadcasting Authority of Ireland had granted the use of 14 radio frequencies for the duration of the conference, on each of which interpretation was transmitted in a particular language from a particular meeting hall. Pilgrims listened to the interpretation using small radios. What benefits did your client see as a result of your work? First and foremost, the pilgrims enjoyed high-quality and precise interpretation, because all my interpreters were professional conference interpreters with experience of religious events, working into their mother tongue, with no relay interpreting. Secondly, thanks to careful assembly and integrated flexibility of the interpreting team, the client enjoyed good value for money as their budget was optimized. Thirdly, logistics went smoothly, thanks to meticulous planning and attention to detail. To give you an example, the weekend before the event I personally did a dummy run on the bus route from the interpreters’ hotel to the venue to check the access points and security arrangements, even interviewing the Dublin Bus driver about his expectations of traffic conditions. Such attention to detail is time-consuming, but it’s what makes the difference. Like all Calliope members, I provide interpretation services which are personal, meticulously planned, and made to measure. Alexandra herself had an unexpected end to the week when she was recruited to interpret the words of a family from Burkino Faso for the Pope and 80,000 spectators at Croke Park Stadium. Calliope-Interpreters is a global network of consultant interpreters, who can provide advice and expertise to ensure that your next multilingual meeting is a success. Contact us to discuss your interpretation requirements.